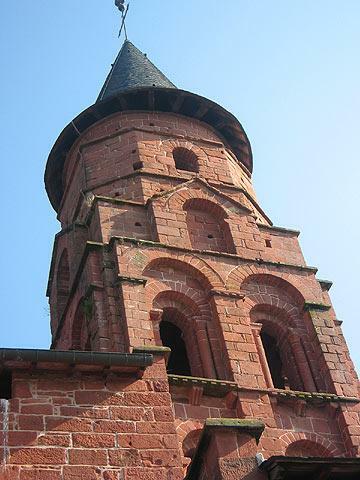 Collonges-la-Rouge, one of the 'most beautiful villages of France', is 23 kilometres southeast of Brive in the Limousin region. It is a very attractive village and very popular with visitors to the region. 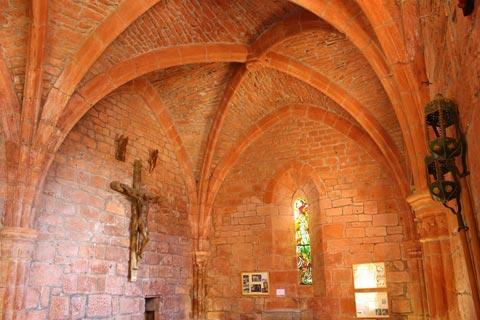 The village dates from the 8th century when monks from Charroux (now in Poitou-Charentes) founded a priory here. 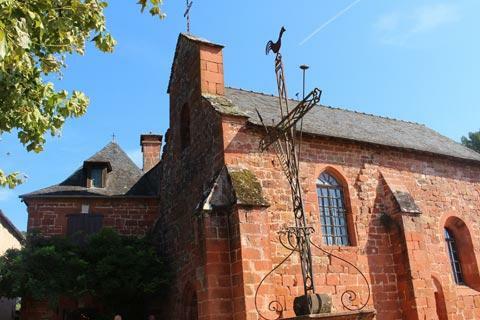 Collonges then developed around the church and priory in the following centuries, with a further boost in the 13th century when the inhabitants were granted exemption from taxes by the Viscounts of Turenne. 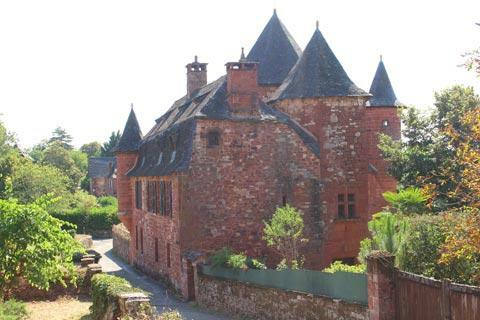 Over the following centuries many local noblemen and businessmen built houses and castles in and around the village. The village prospered with income from vineyards until the end of the 19th century when phylloxera destroyed the vines (as it did in many parts of France). More recently the village has focussed on developing a local industry based on tourism. The first thing you will notice when you arrive is the colour of the buildings - more or less all the houses have been constructed from the local sandstone, which is very red and quite unlike any village I have seen before! We did notice that some of the houses have the remnants of crepi/render on the walls - perhaps originally the stone was covered up and the town was less red? 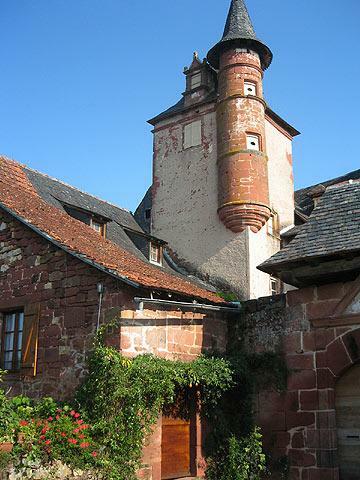 Collonges la Rouge is a lovely place to explore, as each winding pathway and alley leads to another (red!) turreted house or pretty patch of garden. 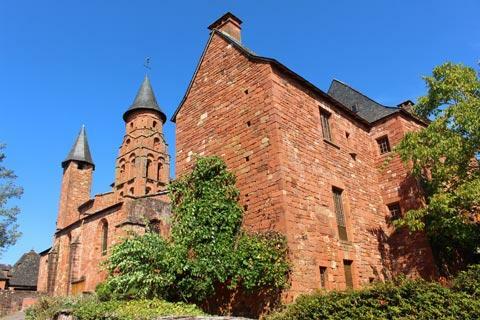 The historic centre is also pedestrianised which adds further to the charm of a visit: a small village, Collonges-la-Rouge doesn't take long to explore but contains many notable monuments. 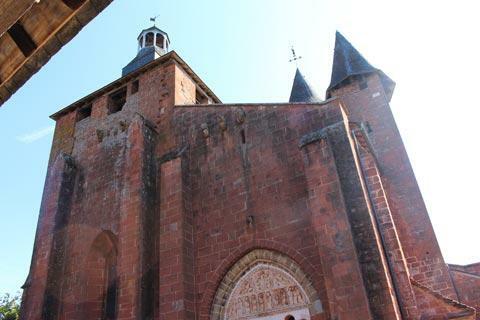 The 12th century roman style Church of Saint Peter is one of the main buildings of interest in the village and particularly striking - in part for its quality, and in part because it has the only white stone to be seen in Collonges-la-Rouge, used in the carved stonework above the doorway. 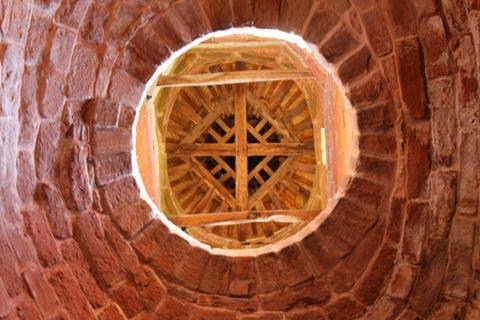 Inside the church you can look up the inside of the tower and see the detailed carpentry work involved. 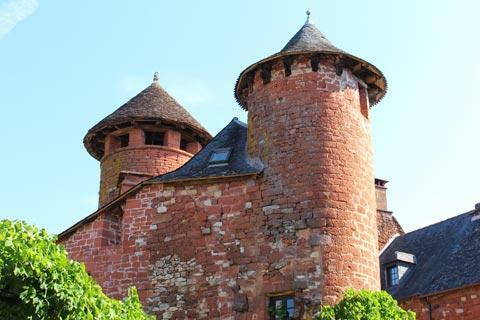 One unusual characteristic of the buildings in Collonges-la-Rouge is that several of them are very grand houses and very few are small simple cottages: it seems that to live here, even in the Middle Ages, you needed to be very rich! 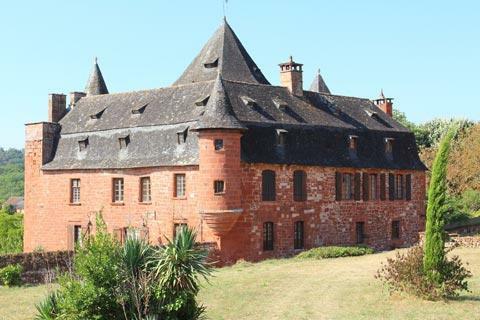 Among these imposing 16th century houses are the house of the Ramade de la Serre (with a square tower); the House of the Mermaid (with a carving of a mermaid outside); the houses of the Vassinhacs et Benges, and the lovely renaissance building called the Court of the Chatellenie. 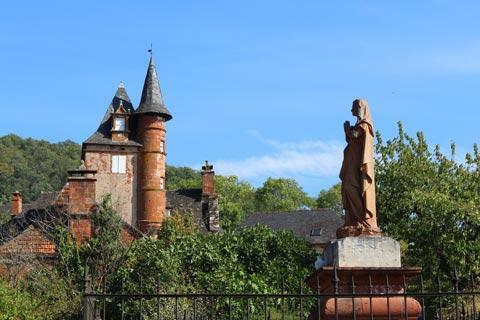 If you walk as far as the eastern edge of Collonges-la-Rouge, close to the Place du Lavoir you can see the turrets of the Castel du Maussac, slightly outside the centre of the village but certainly one of the loveliest houses here. If possible visit the town outside high season to avoid some of the crowds. 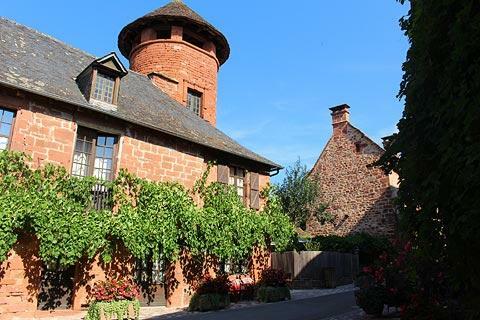 Note: Collonges-la-Rouge is one of the few 'most beautiful villages in France' outside Provence to demand payment for parking. Three euros at the time of writing. Just below the church you can start the walk to nearby Saillac, a small village about two kilometres away and with a 12th century roman style church. 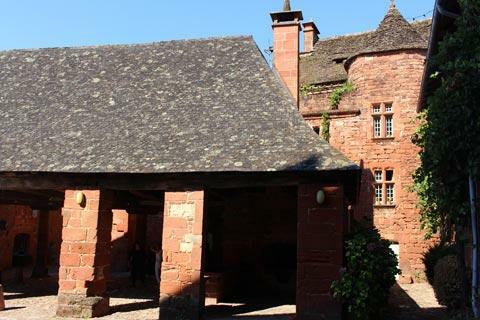 The market town of Meyssac is also very close to the village and has a town centre with several interesting historic buildings, also built mostly in the same red stone as Collonges-la-Rouge. 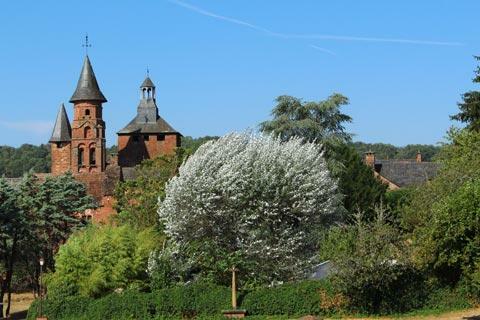 There are lots of very picturesque villages set in the scenic countryside around Collonges-la-Rouge. 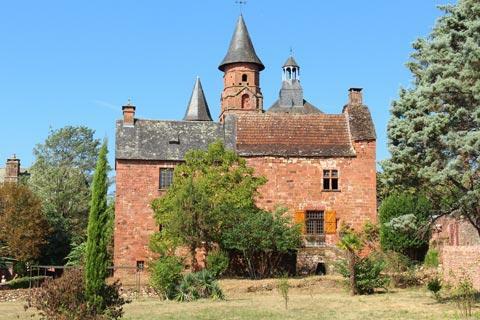 Two of them - Curemonte and Turenne - are also listed among the most beautiful villages of France, while Martel is a slightly larger historic town nearby.